Let’s test out this Comicpress thing all the kids are talking about. Manly Guys doing Manly Things. Yellowknifer Column 20-Men. Men. Men. Manly Men. Congratulations. You have posted the first comment on the first strip of this comic. Your comment will be seen for years, as every newcomer looks at the comments. Ya know…when I saw Space Marine I was thinking Warhammer 40K. Silly me I guess. D8 I’M PUSHING IT! I’M PUSHING IT! PLZ STOP HURTING ME! P.S. there is an inappropriate apostrophe in this comic. But the fact that it was around my 10th reading when I noticed it testifies to the sum hilarity, yes yes? Hm, all the apostrophes I see in there were intentional. Sometimes I use them in dialogue in places that would be grammatically incorrect in a formal sense to represent a beat in the character’s train of thought. Like a mini-ellipsis. It’s an “it’s” vs “its”. The latter is possessive, which is probably what panel 4 wants. Apostrophe–not comma. It’s versus its. Oh, phft, total brain blank there. No, no, “it’s” is right. “its” would imply a plural “it”. The apostrophe makes it possessive. “It’s” means “it is.” You just made my grammar hurt. For Christ’s sake, I already fixed the typo and you guys have more than driven this topic into the ground. Feel free to stop beating this dead horse anytime now. Hey look at me, I’m the ninth layer of replies! That, like, never happens. I enjoy webcomics and punctuation! No, “its” is not just plural “it”s, it’s (it is) the possessive as “it’s” means exclusively “it is”. To the above conversation, as a professional grammar nazi, and to help out Coelasquid a bit, I feel the need to point out that it’s is, in fact, incorrect, as ‘it’s’ means “it is.” In the strange case of it’s vs. its, the one with a lack of an apostrophe is the one that is, in fact, possessive. The other one is, and can only be, a contraction. As for the rest of my comment, since I’ve just come onto this comic, I must say that I am DEEPLY enjoying this. The current Pokemon arc is making me very, very happy. And Kratos in this one makes me giggle so very much. I can’t wait for more. Ah, fail… Accidentally, two – Tyros’s. In the strange case of it’s vs. its, the one with a lack of an apostrophe is the one that is, in fact, possessive. 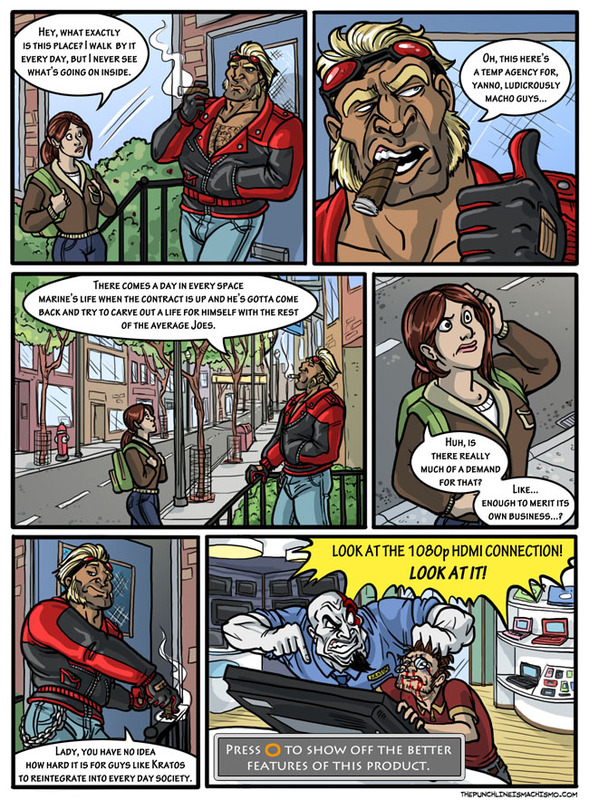 The last panel is an example of why the phrase “What Would Kratos Do?” will get you not only fired, but also arrested in most cases. I read ’em all in reverse order. I think this one’s the best, actually. I came back to visit the first page again, and it still makes me laugh. I tip my hat to you Coelsquid. I also tip my hat. Hat? You mean laurel… Thing? I thought that said “I tip my head” not hat. What was I thinking? Omfg, I wondered why the “Press O to…” scene looked familiar. Woah… maybe this is just a testament to how much my favorite webcomics blend together in my head, but the nerd getting beaten up in the last panel reminds me of Hanna from HINABN. I was coming back to here to link the page to someone, and I noticed this is labeled page 71. Am I missing 70 pages of awesome? I love you….. please don’t ever stop being awesome. I think someone should bring you cookies everyday just for your awesomeness. I LOVE YOU…. please don’t tell your husband. Kratos:Legendary grandmaster of salesmen who brings a brand new perspetive to “hard sell” concept. Who’s da man, huh! HUH! This doesn’t happen too often, but I think I’m sold on this comic after just the first page. Come on guys! B25’s Rock Lobster! One of the best songs of the 80s! Christ, I just finished it yesterday, and I’m back here. And here we go again. You made a really good comic. Is it just me, or has the Commander gotten a lot handsomer since you first started drawing him? I just read this entire thing backwards, starting with the most recent page, and have now finally made it to the first. Good show. Very confusing, and I probably shouldn’t have done it this way, but…eh. So will we ever get back to the whole agency aspect? It seems more like a small group of friends at this point and we don’t really see the macho office drama anymore.